It seems like we are at a time in the year when the number of birds has increased. I can hear them everywhere when I walk along the wooded trails of Occoquan Bay National Wildlife Refuge. The problem, though, is that most the leaves are still on the trees, so I am having huge problems spotting the birds and if I can’t see them, I can’t photograph them. Downy Woodpeckers are the smallest woodpeckers in Northern America, but what they lack in size, they seem to make up in energy. They always seem to be super energetic and industrious and are one of the birds that I am able to spot throughout most the entire year. Nice capture with leafy background, Mike. I expect you are seeing a flood of avian migrants these days, though woodpeckers, to my knowledge, are year round residents. Thanks, Eliza. We have been getting some of the migrating species coming through. Today, for example, I saw some Palm Warblers and Yellow-rumped Warblers. There are probably lots more that experienced birders would be able to spot–I am a neophyte when it comes to birding. Nice capture of this little fellow, Mike! I’m glad to know you are at least hearing more birds. We are still in quite a lull. Nice Mike! 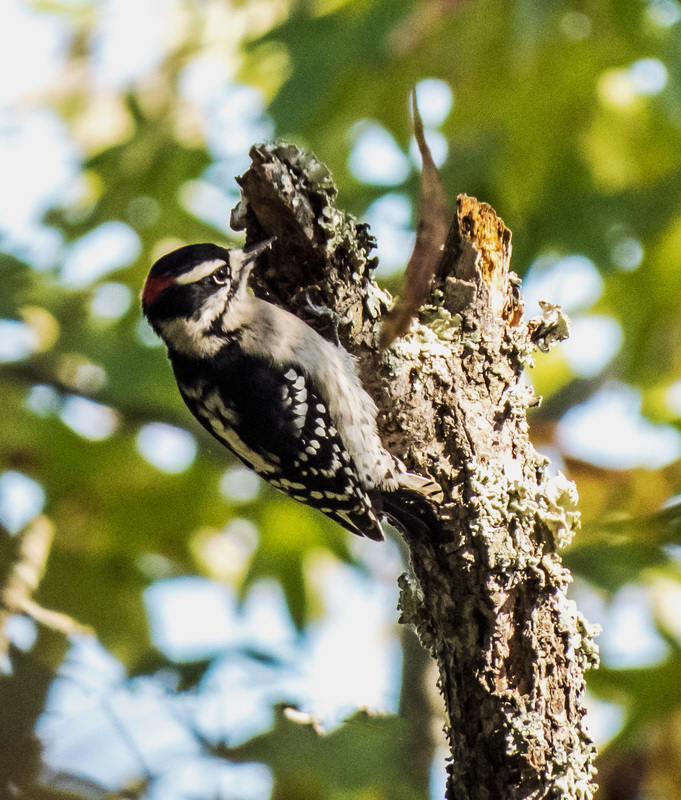 Always fun to photograph woodpeckers! Indeed it is. I have always admired the intense focus of woodpeckers as they pack away in search of insects. I love seeing these little guys at work – unless it’s on something in my yard, like my house. Great photo, Mike.